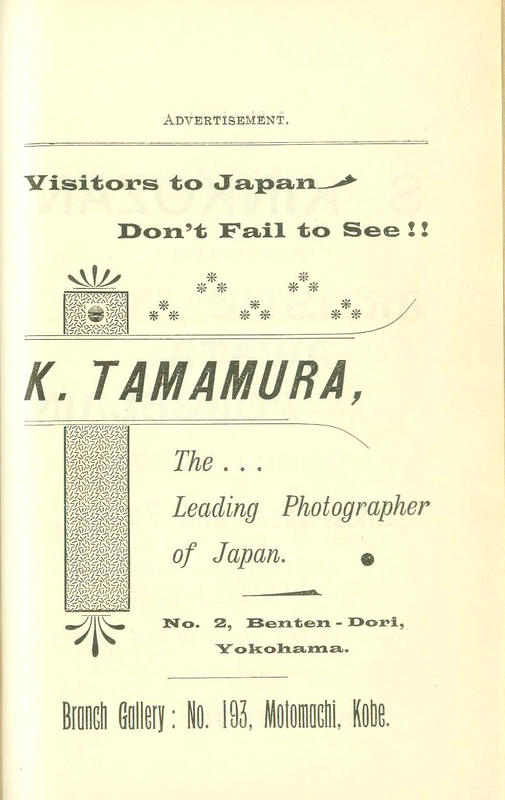 More scans from that antique, turn of the century, Japan travel guide; these are advertisements found in the back of the book. 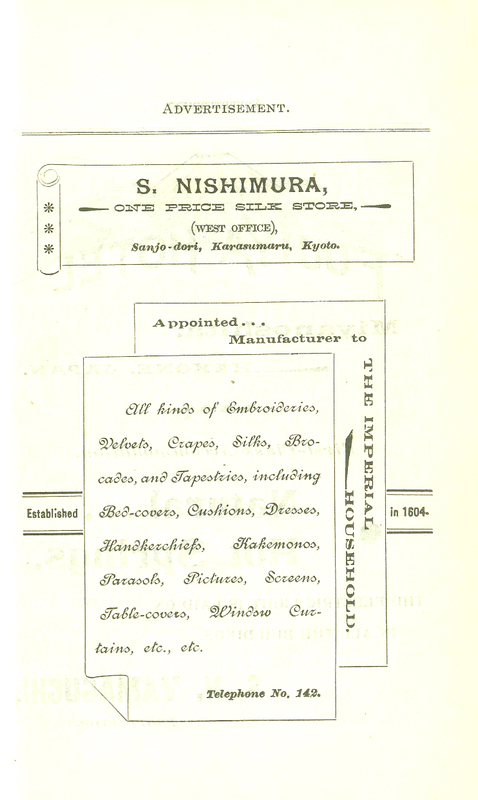 S. Nishimura, “one price silk store,” founded in 1604. 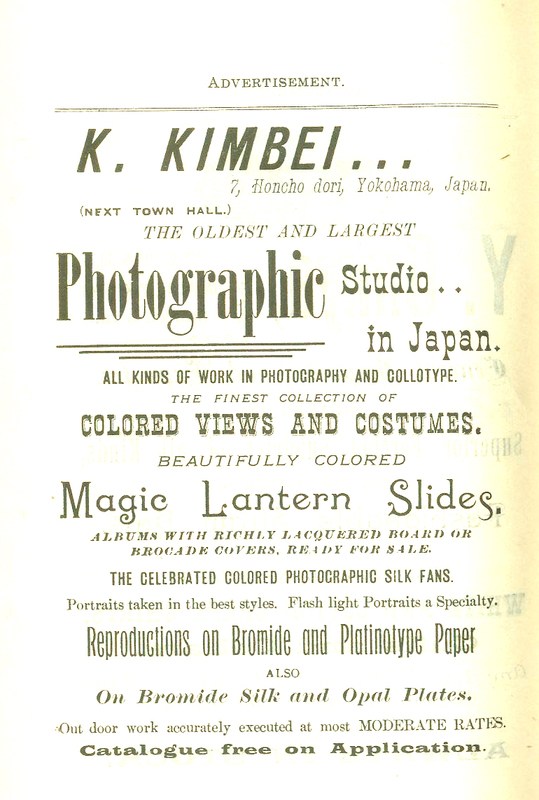 K. Kimbei, a photographic studio promoting magic lantern slides, among other items. 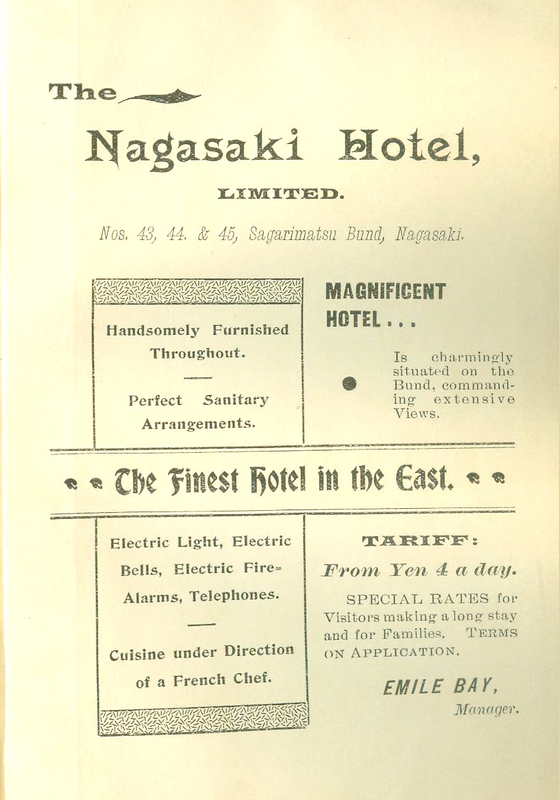 An ad for the Nagasaki Hotel. 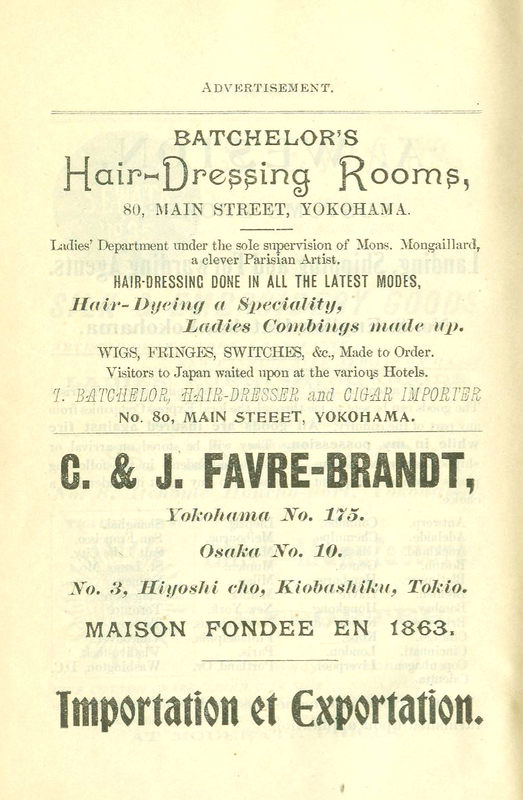 The top half of this ad is for the Batchelor’s Hair-Dressing Rooms, “Ladies’ Department under the sold supervision of Mons. 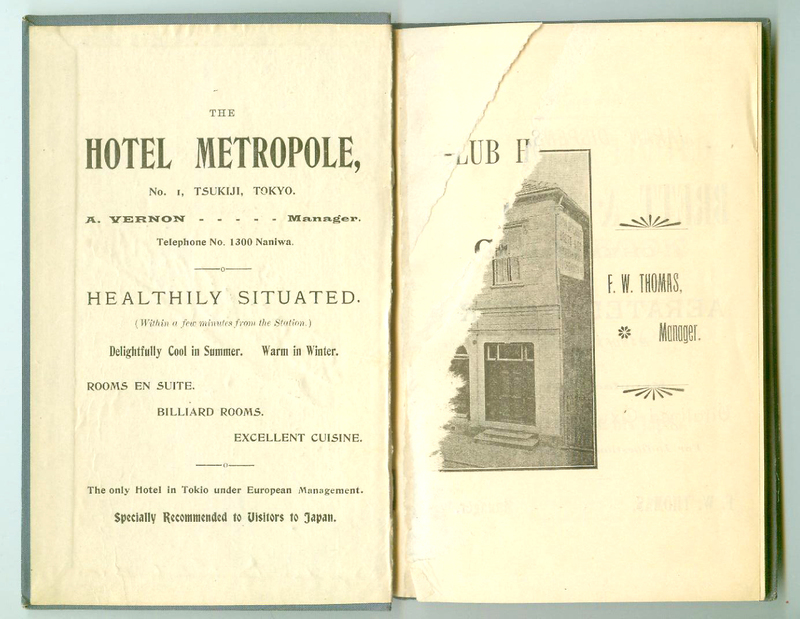 Mogaillard, a clever Parisian Artist.” (Note that cigars are also available — for gentlemen only, I’m sure!) 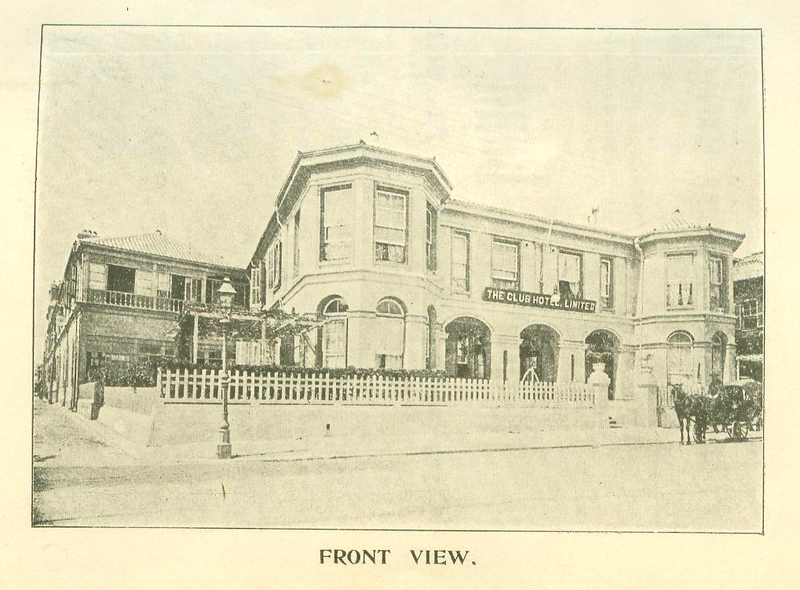 The bottom half is for C. & J. Favre-Frandt, an import-export shop. 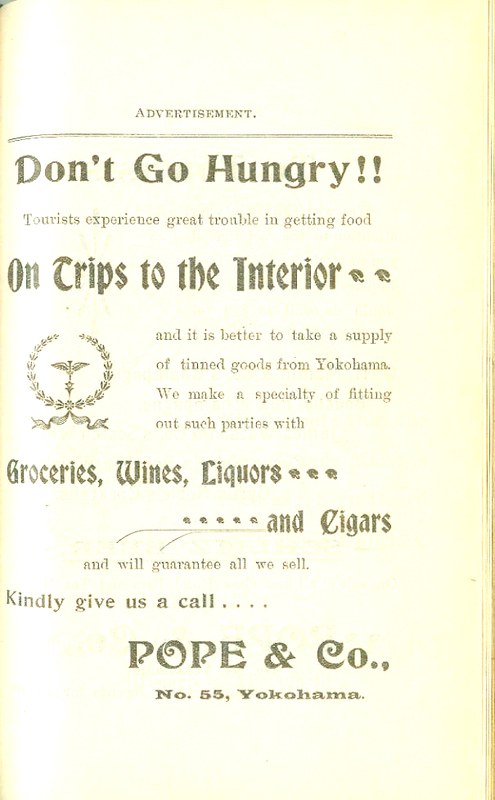 Pope & Co. worries that you’ll perish from hunger on trips to the interior! 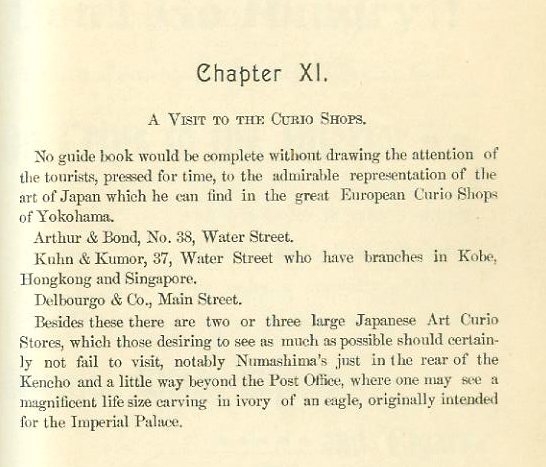 The small print mentions tinned goods, but the large print mentions wines, liquors and cigars. 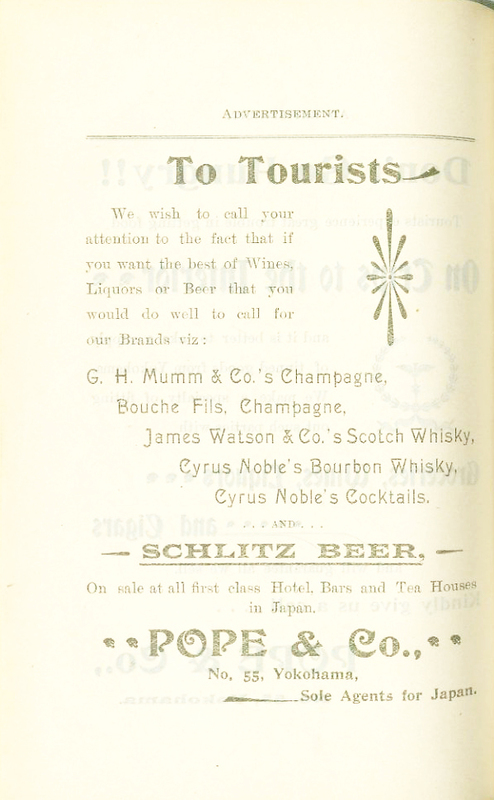 The next page is a continuation of their ad which meantions specific champagnes, whiskey — and Schlitz Beer! 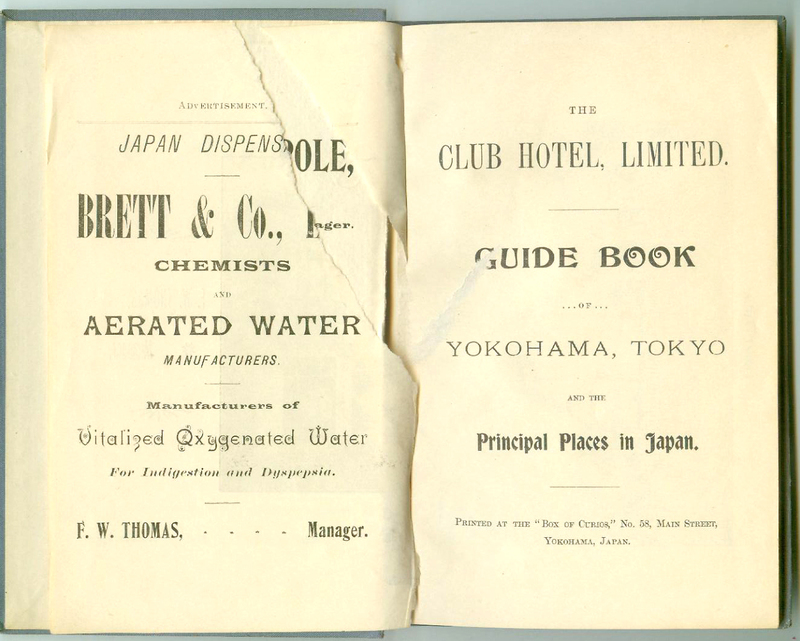 There are many charming and antiquated things of note in this antique travel book titled The Club Hotel, Limited: Guide Book of Yokohama, Tokyo and Principal Places in Japan and I thought I’d share a few of them before this book and map sells. 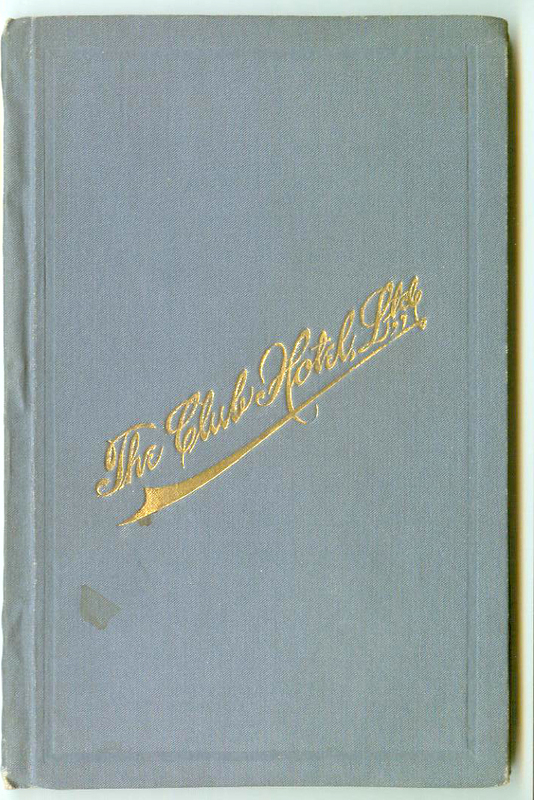 Apparently, The Club Hotel, Limited was an actual place as there are photos of the building, the entrance, the dining room, and the bar. 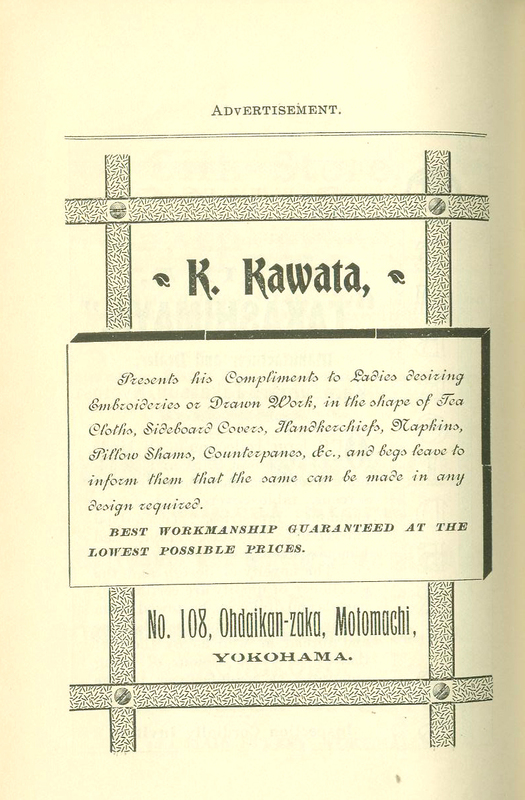 The Japanese will be found pleasant mannered people. 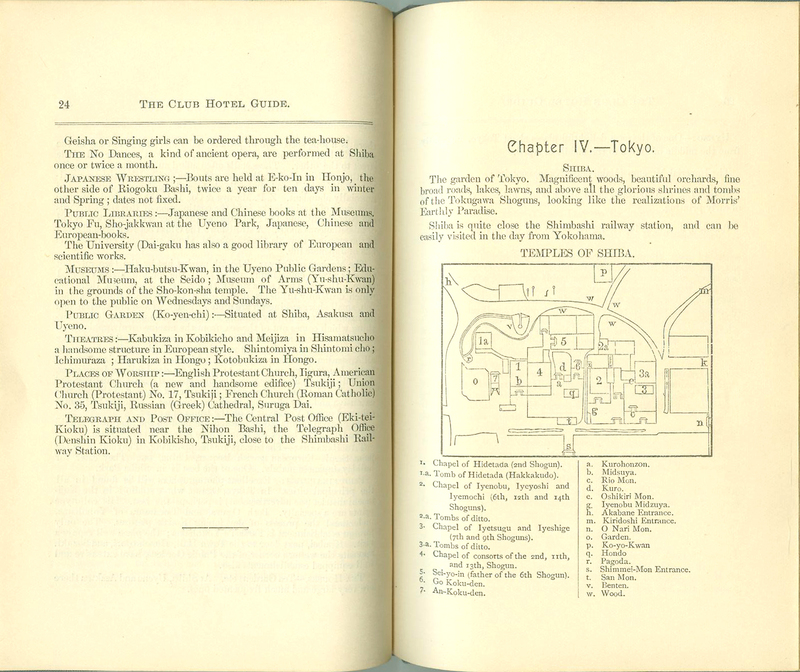 Treated politely, they are invariably polite, and as a rule very kindly disposed towards foreigners. Many of them are incorrigible procrastinators. It is always “to morrow” with them. 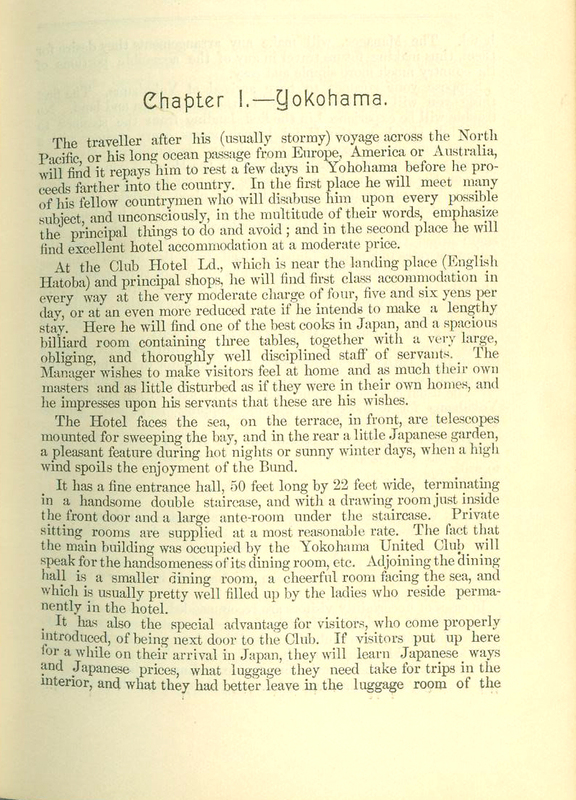 Hotel servants, however, are often very quick, as well as good and attentive, and seeing so much of foreigners they understand foreign requirements. 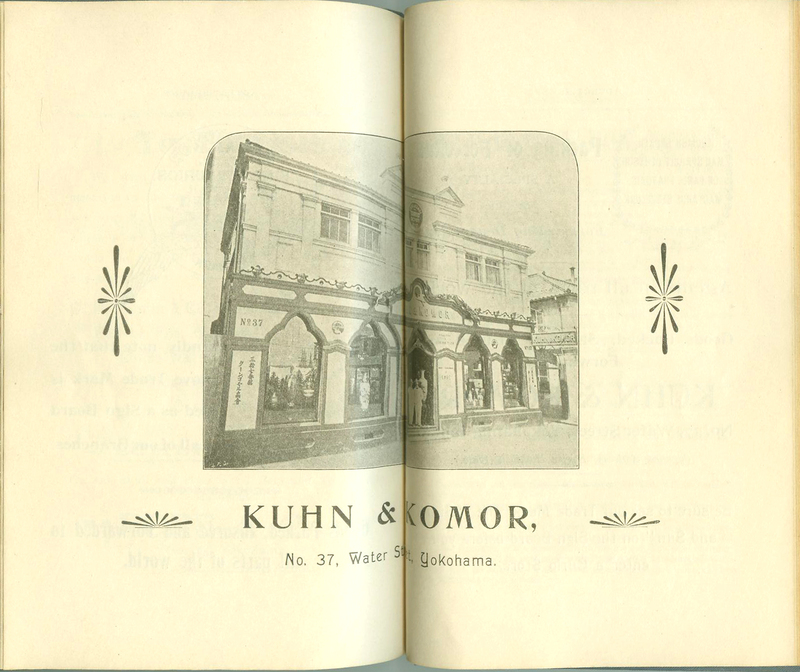 Most notably, Kuhn & Komor, No. 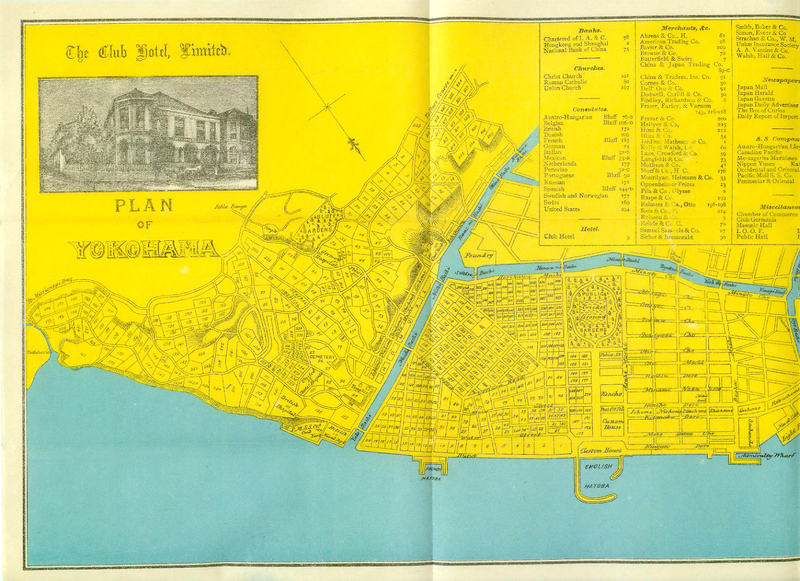 37, Water Street, Yokohama, which asks you to kindly note the company’s trademark “Stork and Sun” used as a sign board on all their branches. 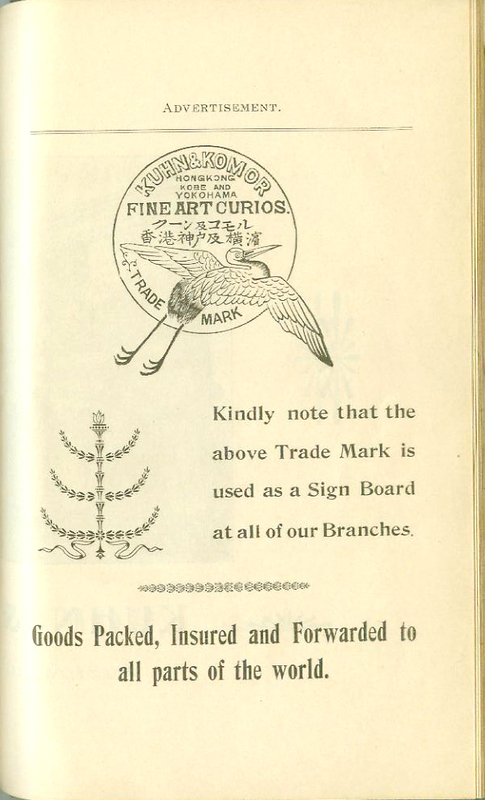 A few other interesting old ads I’ve scanned will be posted soon! 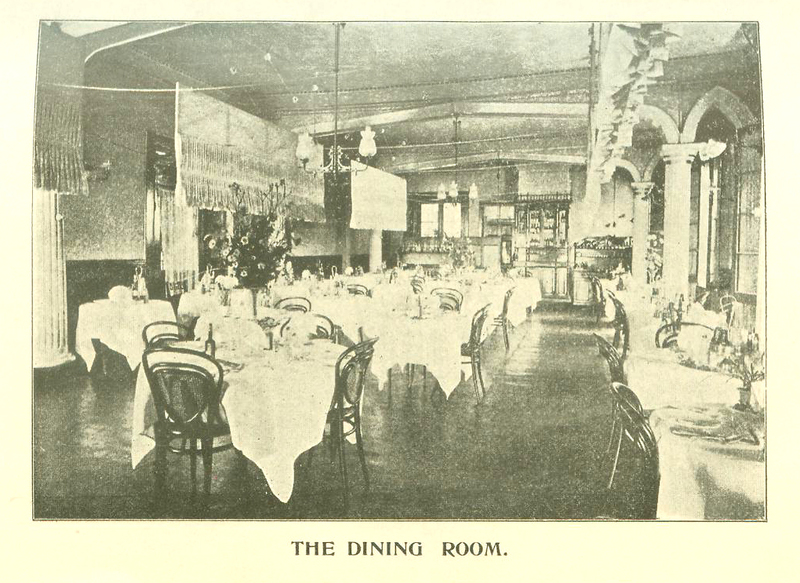 But, unfortunately, this vintage advertisement was for the Bearskin Motel. Which doesn’t bode well for bears. And if I dance too, am I also performing some sort of death dance? That’s too frightening. 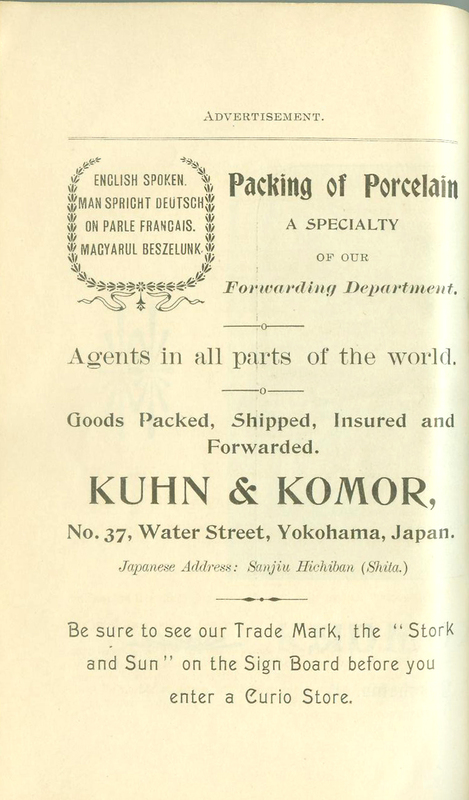 Too much for recommendations from Triple A and even Duncan Hines to overcome. 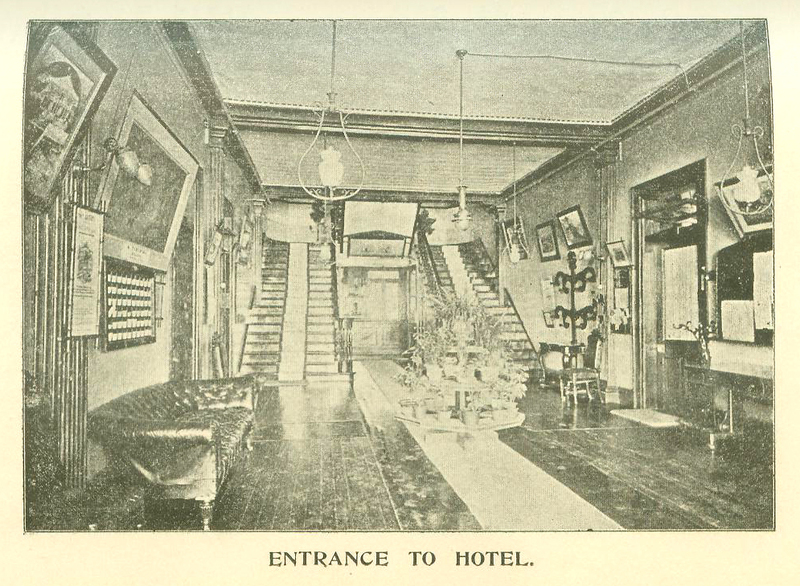 I’m not certain this Bearskin Motel, of Gatlinburg, is affiliated with the Bearskin Lodge in Gatlinburg. Even though it looks likely to the same same family ownership, they probably shouldn’t be condemned for the promotional sins of their fathers. 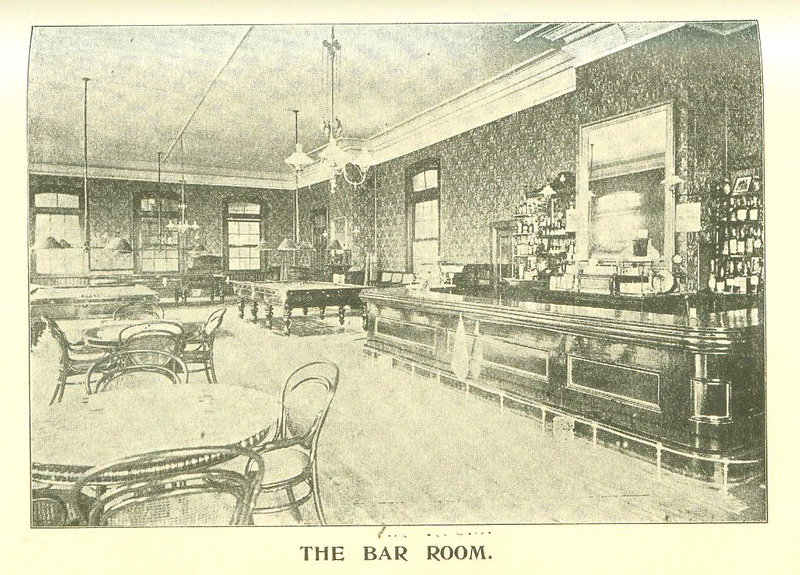 But I’m not sure I can move past it… If I find myself visiting The Smokies, I don’t think I’ll be staying there. Oh, the nightmares of the poor bears!